There are SO many professional development focused books out there that it can be so difficult to know which ones are worth it to find at the library or buy on Amazon. Never fear! 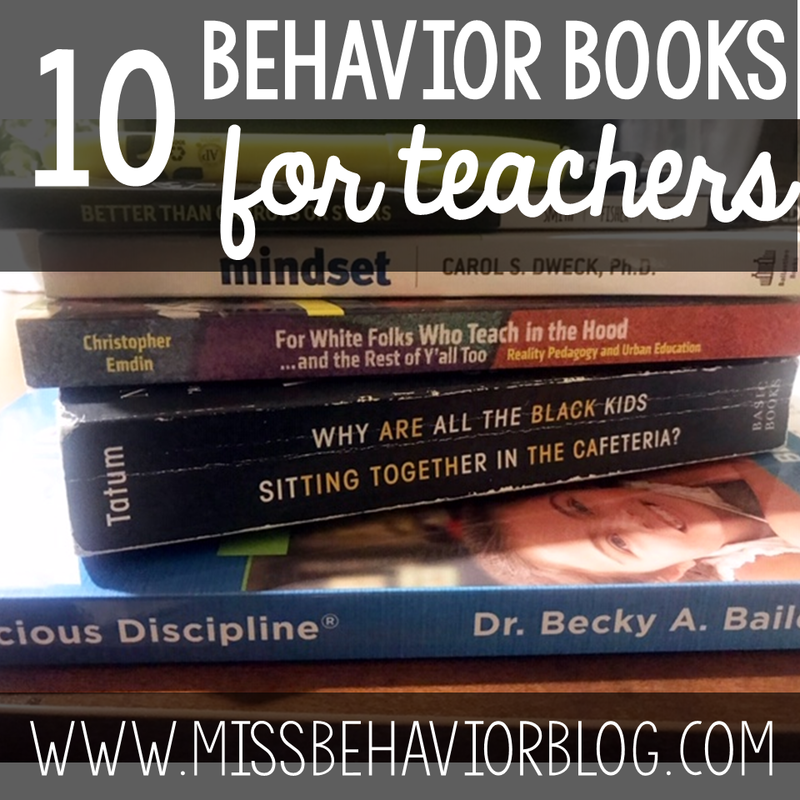 Here are the 10 behavior focused books that I would recommend to ANY teacher looking to better understand effective strategies to support student behavior. This book has stories, craft ideas, meditations, games, and more all focused on developing healthy coping skills. It's categorized into each area (ex: anxiety, anger, depression) so it's incredibly user friendly and very easy to apply! I love everything CD does, especially for elementary aged students! There is so much in the CD framework which you can really dig into on their website, but I love this book for learning. Bailey includes the "why" behind each component of the CD model and how to implement these concepts into your classroom. This book is such a gift - there's no focus on discipline, but how to ethically set up proactive classroom routines and procedures so that students focus on the results of actions and process them effectively for real behavioral change. I love the immediacy of this book - strategies and ideas that you can read and immediately implement! Makes it such a tangibly useful book that focuses on positives rather than punitive strategies that we all know don't actually work. If you have followed me for any length of time, you know my deep love of this book and author! The concepts in this book completely shaped my classroom and allowed me to move away from punitive means of punishment and focus on problem solving and teaching missing skills. 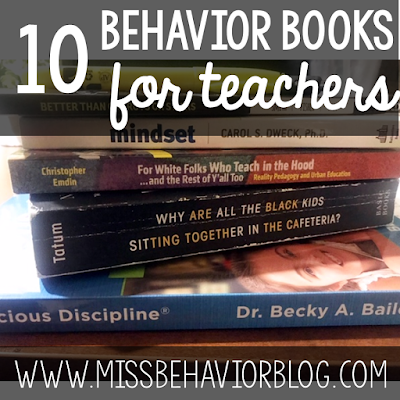 The best part of the book is the back - tangible check lists and question banks to help you get started in really getting to the root of challenging behavior. This book breaks down common frustrating behavioral issues by using 5 named strategies. I love how this book focuses on collaborating with the student or group of students to solve the problems! I found this to be especially helpful for problems that affect the whole class. Restorative Practices is such a buzz word these days, but it's for good reason. This is one of the best books I have found to effectively explain these practices AND offer practical and applicable ways to introduce them into your school foundation. It's a super easy and quick read and would be an awesome whole school read. This book completely changed my teaching. This book explores girls in juvenile detention centers - the stories of the girls, how they ended up incarcerated, and how school systems have perpetuated this cycle through the misunderstanding of black girls. Truly a book you MUST read and one you'll never, ever forget about. This is a great book for school leaders - it goes through simple school wide systems (really simple and ones that appear to often be over managed and over thought) that could proactively stop so many chronic behavior problems. I also love that part of the book focused on parent/family involvement, and ultimately buy-in, in the process of developing these systems. This book focuses on very tangible ways to create trauma-sensitive environments that help educators better understand the impacts of childhood trauma on student success, as well as create school environments that support students who have experienced trauma. The book is totally rooted in research and each chapter includes exercises and reflections so you can be really active while reading. The content is applicable for literally any age group. This is one of the best books I read to prepare me for teaching in a residential treatment facility.